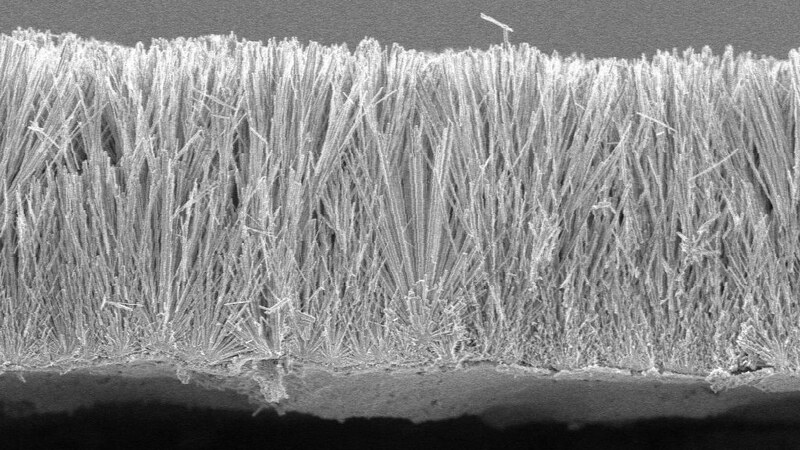 Research has shown a new and efficient way of developing zinc oxide nanomaterials, a key part in the conversion of light energy to electricity in solar panels. The research, conducted by Integrated PhD Sustainable Chemical Technologies student David Miles in the Centre for Sustainable Chemical Technologies (CSCT), has shown how a technique called Electrochemical Anodization (EA) has successfully created a number of zinc oxide nanowire structures with properties that will help increase the efficiency of solar panels. Solar energy is one of the most widely used renewable sources of energy. Its capacity almost doubled in 2014 growing from 2.8GW to nearly 5GW, with 650,000 installations ranging from solar farms to panels on homes. There are a number of different types of solar panels with this research particularly benefiting dye-sensitised solar panels which work in a similar way to the leaves of a plant in that they contain a chlorophyll-like dye which absorbs light energy from the sun. When the light energy is absorbed into the cell, it creates an ‘excited electron’ which then injects into the nanomaterial and transports the charge, generating an electrical current. Zinc Oxide is an ideal nanomaterial for transporting the ‘excited electron’ from the dye as it is transparent and doesn’t compete with the dye in absorbing the light. Using Electrochemical Anodization, the researchers were able to create zinc oxide nanowires containing poly crystalline structures which have much higher surface areas. As a result of the greater surface area, the dye-coated nanowires are more efficient at absorbing light and subsequently better at transporting the electrons. Nanomaterials are extremely small materials that have dimensions on the nanometre scale and play a significant role in developing more efficient renewable technologies, removing pollutants from the air and water, and the treatment of diseases. Compared to materials on the usual (macro) scale, nanomaterials benefit from having very large surface areas compared to their volume, meaning they are an ideal place for chemical reactions or other surface-based processes to take place. Dye-sensitised solar cells have a number of advantages over traditional solar technologies including their lighter weight, greater flexibility and cheaper manufacture costs. They can also be produced semi-transparently and in a number of different colours meaning they can be incorporated into stained glass windows. This allows architects to consider a building’s potential solar technology capacity at the early design stages as part of the build process rather than installing what can be seen as unattractive panelling to finished buildings. Supervisor and Associate Professor in Chemical Engineering, Dr Davide Mattia, added: “Electrochemical anodization is a powerful yet simple fabrication technology to produce complex structured materials at the nanometre scale. The fabrication technology can be scaled at a level compatible with industrial and commercial use and can be applied to a variety of starting metals, all producing different types of nanostructures. Research carried out by the University of Bath’s Department of Chemical Engineering was recently ranked sixth nationally for impact by the 2014 Research Excellence Framework, an independent assessment of UK university research activity.